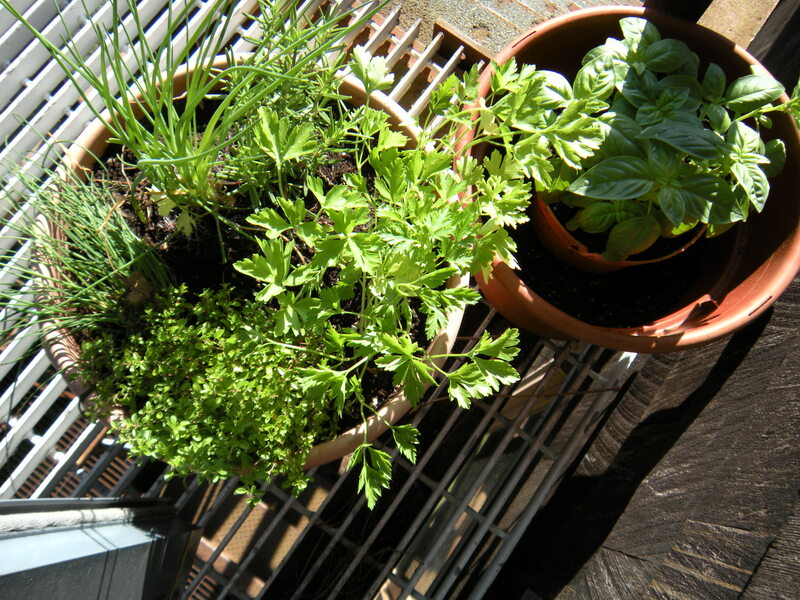 parsley, (basil), rosemary and thyme by the back door. . .
Do you ever notice when something happens and one of your automatic responses zooms in? I’ve noticed lately that I’ve been able to take a step away from that automatic response and take a different tack. Whoa, when did this start happening? I think when things piled up on me this Spring, I just felt overwhelmed for awhile, something I don’t normally let myself indulge in. And I lived for a couple of weeks with a feeling that I just didn’t have any reserves left. I just didn’t care about things that mattered to me before. I think this defense mechanism has succeeded in washing away a lot of “shoulds” and “have-tos” in my system when actually they don’t really matter. They never did matter much anyhow, but now, I actually experienced not caring about them anymore in a way that didn’t help and sometimes hurt me. For example, I summoned up courage enough to tell someone point blank why things were not going to work out for a visit that we had thought about having in the Fall. I didn’t spend a lot of energy leaning over backwards or second-guessing myself either after waiting for a response, then being told of an unreasonable travel itinerary that would have put everyone out, including herself. I felt battered by one too many demands about “this is the way its done here” when everything was about them and nothing was about us together. Given that, I believed that we could hardly decide where to go out to lunch after that, never mind who was paying and what we wanted to do. So, I called it off. It was a little awkward, but worth it to nip it in the bud. I’ve also noticed that another thing that has or is going bye-bye is the feeling that I have to fix everything. Or prevent things from happening that might need to be fixed later on. Lots of energy is freed up when you don’t have to save the world of minutiae that pops in front of you every single day. Whew, what a lot of trivia disappeared with that category of daily concerns! What this has done is to have cleared the clouds out of my eyes and made me feel like putting on a nice overshirt and a flower necklace from Anthropologie to go out to a Portuguese restaurant for dinner that we haven’t tried yet. Or to look for a straw hat and buy some sunscreen so that we can actually sit out on the rocks and watch the ocean after Hurricane Arthur approached the New England coastline over the 4th of July. Or, read some English cottage novels and make some Lapsang Souchang tea in the afternoons with a little lump of light brown sugar and milk. There’s no reason for me to think (or justify) that I am only living on the periphery of my life when I can live within those margins much more fully. It’s a matter of seeing the important things more clearly and letting the rest of it recede where it matters little if at all. I know that we are fortunate in our lives to have family, love and enough resources to do what we enjoy doing and to manage injuries and the rest of it as they come along. And yet, it’s another thing to un-hook oneself from some of the hangups we have in our heads that manage to catch us up, like brambles on a bush that catch one’s clothing as we walk on our way to the beach. Beautiful sun and light breezes are what the day and a half of rain and thunder have left us for the weekend ahead of us. We’re on our way up to spend the weekend by the sea in a little rented studio which is just right for us. And it couldn’t have come at a better time. Sounds like a wonderful way to enjoy your weekend by the sea… and beyond! Have a great time!